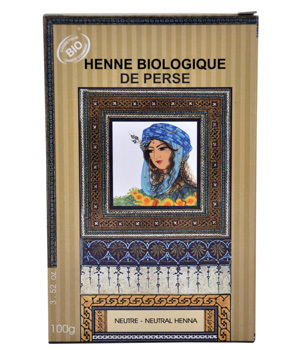 The Iranian henna is recognized by specialists as being the best for its content in essential oils and pigments. It is a plant of which leaves, flowers and roots have been used for thousands of years for their therapeutic and colouring virtues. When used regularly, this hundred percent natural product will nourish, strengthen and protect your hair, giving it softness, volume and bounce. Depending on its contents and application time, it will also allow you to enhance the natural colour of your hair. 100% of total ingredients from organic farming.